It’s only July, but major universities and college football programs are already launching Heisman campaigns to generate the much-needed media exposure for select candidates. Anyone who follows college football knows about Washington’s Jake Locker, Ohio State’s Terrelle Pryor and last year’s Heisman-winner, Alabama running back Mark Ingram. If you just take a look at his numbers, it’s amazing that the explosive running back is not on everyone’s watch list, but surprisingly, many of the so-called experts do not have Devine listed as a threat to take home the coveted trophy. Devine burst on the scene as a true freshman, when he took carries away from All-American running back Steve Slaton. After Slaton was injured in the Fiesta Bowl, which meant Devine would have to carry the load for the Mountaineers, and he delivered, rushing for 105 on just 12 carries with two touchdowns. His numbers increased his sophomore season, as he rushed for 1,289, and despite being hampered by minor injuries for much of last season, the talented back still managed to rush for 1,465 yards and 13 TDs. If this trend continues, and more importantly, if Devine can avoid injury this season, there is every reason to believe that he could break 1,800 yards this season. That sounds like a high number, but it is more attainable than you may think. 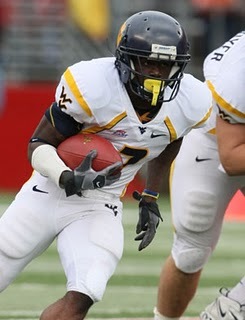 Since his arrival in Morgantown, the electric running back from Fort Myers, FL has averaged 6.5 yards per carry. If he can stay healthy, there is every reason in the world to believe that he will get more carries than last season. If he gets just 44 more carries than last season, that would put him at 285, putting him over 1,800 yards, given his career yards/carry average. College FootBlog takes a look at the two things must happen for Devine to get serious consideration from the media and ultimately, the voters. West Virginia must win the Big East: Six out of the last seven Heisman Trophy winners played on conference champion teams. This could be a tall order for Devine and the Mountaineers, and given the emergence of the Big East as a formidable BCS conference in the last couple of years, it is. But despite the success of WVU, Cincinnati, Pitt and others from the conference, the Big East is still unfairly viewed as a little brother to the other conferences by most writers. In order for the national media to take notice of a Heisman candidate from this conference, they will have to win, and they’ll have to hope that others in the conference like Pitt and Cincy win as well. This would set the stage for a national TV audience for the “Backyard Brawl” rivalry game on Nov. 26, when WVU travels to Pitt to take on the Panthers. Will it happen? They should be in the hunt, but the Pitt game will likely determine who wins the Big East. West Virginia hosts Cincinnati, South Florida and Syracuse before the Pitt game, and they travel to UConn and Louisville. Unless something unforeseen happens, the Mountaineers will be favored in all of these games. If they take down Pitt, the conference title will be theirs, and they will lock up a BCS game, and the media will notice. Devine must avoid injury: At 5’8″ and just 176 lbs., Devine is far from a bruising back. The only thing preventing him from eclipsing 1,500 yards last season was the fact that he played much of the season banged up. He still managed to put up some very impressive numbers last fall, but his relatively small frame showed signs of fatigue last year, particularly in the middle of the season. Devine needs at least 300 touches (rushing, receiving and returning) if he is going to put up the kind of numbers that will trump the other candidates. If he gets that many touches, that means he made it through the year without a significant injury, and with his explosiveness and elusiveness, that means bigtime production. Will it happen? It should. Despite traveling to Death Valley to take on LSU in September, the non-conference schedule is not that tough for the Mountaineers. And despite his small frame, Devine has proven to be an extremely durable back. In addition, new quarterback Geno Smith is more of a passer than a runner, which means that unlike in past years, Devine will not be splitting carries with his QB. His strength and durability will be tested, but he has carried 447 times in his two years as the featured running back at WVU. Look for that durability to continue in 2010 because it will be his last season, and Devine will have his chance to ease the concerns of NFL scouts that his body can handle the punishment of a 280-plus carry season.